Vibrant blossoms from a dependable and easy grower. Vibrant deep purple-blue blossoms with a splash of white rise high above the blue stems and emerald green foliage, for a stunning upright display from early summer to first frost. So dependable and easy, these are heat-tolerant, drought-tolerant, and also deer-resistant. 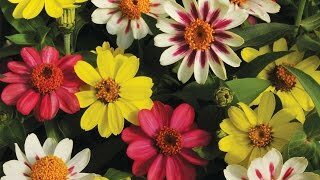 Use in the center of a patio container, in groups in the garden border, or in mass plantings. Salvia may be grown from seed sown early indoors and transplanted outside after frost, or planted as a potted plant. Sow salvia indoors 10-12 weeks before the last frost. Sow seed thinly and evenly and barely press into seed starting formula. Seedlings emerge in 15-21 days. Select a location in full sun with good rich moist organic, well-draining soil. Prepare the bed by turning the soil under to a depth of 6-12, inches removing any debris, and lightly raking as level as possible. Dig a hole for each plant, approximately 12-16 inches apart large enough to amply accommodate the root ball. After new growth appears, a light fertilizer may be applied. Keep granular fertilizers away from the plant crown and foliage to avoid burn injury. Use low rates of a slow release, as higher rates may encourage root rots. Provide plants with extra water in dry weather. Deadheading is recommended to keep plants blooming. These versatile, colorful plants are widely grown in annual gardens, perennial gardens, mixed borders, formal mass plantings, herb gardens, wildflower gardens, cottage gardens, and containers. Compact cultivars add excitement to window boxes. Tall stemmed types are great for cutting.